1951 Simplicity #3552 vintage sewing pattern, misses' one-piece sun dress. 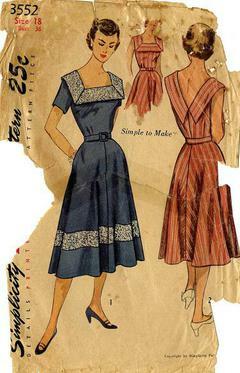 This 'simple to make' dress features a square neckline in front, V neck in back. The flared skirt has pockets in the side seams. Set in sleeves are short, optional sleeveless. Envelope is in poor condiiton, some pieces are cut and in good condition.